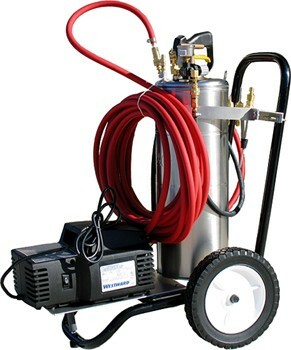 SPRAYER DESCRIPTION: Wood Treatment System This is a heavy-duty delivery system based on a cart sprayer design. The system delivers consistent foam, as well as liquid insecticide from the same 3 gal. tank. 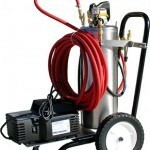 It has a 30 or 50 ft. hose, a powerful compressor, and an adjustable pressure regulator. The foamer can be used for pre-treatments (soil and wood) at construction sites, large crawlspaces, and for power cleaning and treating dumpsters for fly control. Tank pressure can be adjusted to 80 psi to allow for power spraying framing timber or injecting liquid or foam into dimension lumber, or termite and carpenter ant galleries, and under concrete slabs for a standard or re-treatment for termites. This system comes with a 30 foot hose. Call for pricing on the 50 foot option.